The euro today lost ground against the US dollar from the mid-Asian session into the European session as the greenback rallied driven by positive investor sentiment. The EUR/USD currency pair traded at daily lows after the release of mixed PMI prints from across the eurozone by IHS Markit even as the Brexit deadlock capped the pair’s gains. The EUR/USD currency pair today dropped from a high of 1.1440 to a low of 1.1411 before rallying higher in the early American session. The pair’s initial decline was spurred by investor fears of a no deal Brexit, which could disrupt trade across the European Union. The chances of a breakthrough appear slim as both sides are unwilling to make concessions. The release of the Markit Germany services PMI, which came in at 53.0 missing expectations by 0.1, contributed to the pair’s decline. The weak Markit Italy services PMI print also added momentum to the pair’s drop. The Markit eurozone services PMI, which came in at 51.2 beating consensus estimates by 0.4, served to limit the pair’s downside, as did the upbeat Markit France services PMI. The release of the eurozone retail sales data for December by Eurostat had a muted impact on the pair despite the monthly print contracting as expected, and the annualized print beating expectations. The pair rallied higher in the early American session driven by positive investor sentiment. The pair’s short-term performance is likely to be affected by the US ISM non-manufacturing PMI due for release at 15:00 GMT. 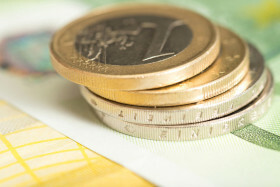 The EUR/USD currency pair was trading at 1.1428 as at 14:18 GMT having recovered from a daily low of 1.1411. The EUR/JPY currency pair was trading at 125.55 having dropped from a high of 125.87.